All structures are always in either tension or compression. Structures can only pull or push. Try this:	Take a thin rubber band. Pull on it. You are putting the rubber band in tension and the rubber band becomes longer. When a part of a structure becomes longer it is in tension. Try this:	Take a thick sponge and push on it. When you push down on it, it is in compression and it becomes shorter. When a part of a structure becomes shorter it is in compression. The amount of lengthening and shortening in a structure is usually so small that it is not possible to see it with the naked eye. The tent poles and the tent strings are part of the structure. See if you can determine whether these are in tension or in compression. An elevator hangs from steel cables. Are the cables in tension or in compression? Sit on a chair. Are the legs of the chair in tension or in compression? A suspension bridge is supported by steel cables anchored on the ground and go over the top of the bridge towers. Are the cables in tension or in compression? Are the towers in tension or in compression? A large pine tree has many branches. Is the trunk of the tree in tension or in compression? Is a stone or marble in tension or in compression? Try this: Find a partner. Put your hands on the shoulder of your partner and have him/her do the same. Move your feet away from each other one step at a time, forming an arch. As long as your feet are firmly planted on the floor your arch will remain in tact and you won’t fall. Why? Now it’s your turn. List 5 more things that are in compression and 5 more things that are in tension. 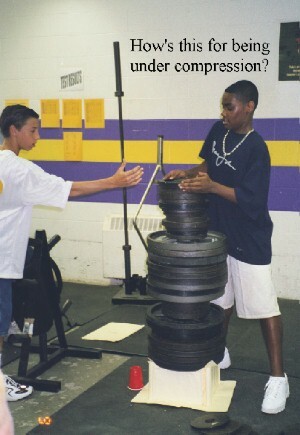 Based on the way that your structure will be tested, must it be stronger in tension or compression and why?